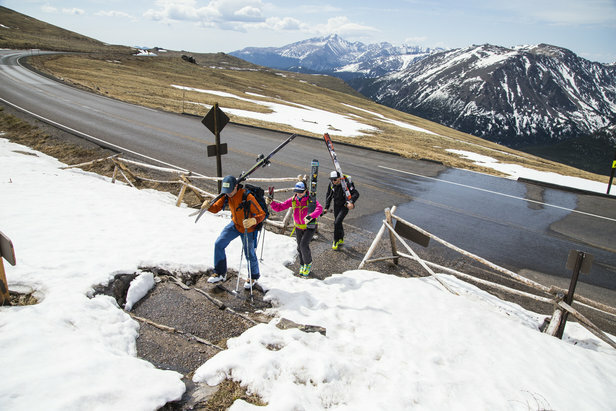 Summer skiing in Rocky Mountain National Park is as easy as driving up Trail Ridge Road and booting up. 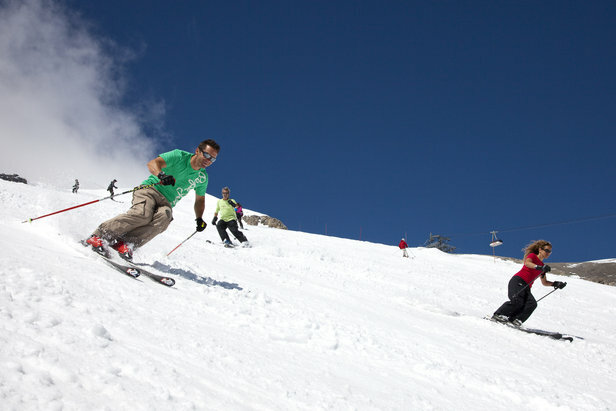 Some view summer skiing like the NFL’s exhibition season. In other words, it’s for fanatics. Even if you’ve traded your ski boots for bike shoes, there’s a real boon in heading to the hills after the resorts have long closed for the season, and Colorado’s Rocky Mountain National Park (a.k.a. 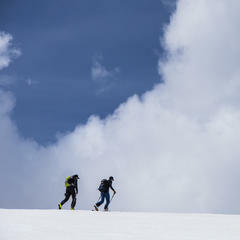 RMNP) is the perfect Colorado backcountry ski touring venue for every level of summer adventure. For one, the juxtaposition of mountain grasses and wildflowers, cascading melt water and snowy peaks makes for great shots. Two, local wildlife practically poses for those photos on account of that green grass. To top it off, tourists in the park will treat you like the wildlife, lending even more cred to earning your turns. Rocky Mountain National Park is a versatile backcountry playground, offering up everything from easily accessible, low-angle snowfields to glaciers with big approaches. Burly daylong backcountry adventures may not be for everyone, but at RMNP, summer skiing can be as easy as jumping out of your car and skiing back down to it. Thanks to Trail Ridge Road, you can get up to 12,183 feet in your own vehicle and access snow deep into the summer months. You’ll likely spot wildlife like elk, bighorn sheep, moose and yellow-bellied marmots or see a fox slinking below you leaving tracks on the summer snow. Many a backcountry skier gets their photo taken by curious tourists surprised and enamored with what they find at high altitude. The challenge here is to see if you can build up a line of cars comparable to that of an elk herd. A quick approach from Trail Ridge Road allows skiers to access the wide snowfield of Sundance in Rocky Mountain National Park. As far as National Parks go, Rocky is aptly named on part of its impressive statistics. The park contains 72 peaks higher than 12,000 feet and is home to Longs Peak, which tops out at 14,259 feet. A quarter of the park is located above tree line, and there’s a smattering of glaciers and permanent snowfields, including Andrews, Sprague, Tyndall, Taylor, Rowe, Mills and Moomaw Glacier. 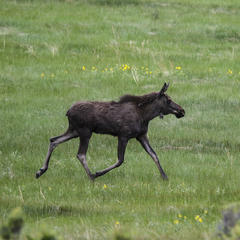 Three years ago, Rocky Mountain National Park celebrated its 100th birthday. The U.S. government acquired the land in the Louisiana Purchase of 1803, and in 1915, thanks in part to Woodrow Wilson, RMNP became the 10th National Park. In the early 30s, the Civilian Conservation Corp helped build Trail Ridge Road, which serpentines through the park, crosses the Continental Divide and reaches a top elevation of 12,183 feet. The road doesn’t open until late May/early June due to extreme weather and snowbanks—often two-stories high—that settle in for the winter. Trail Ridge Road (designated as an “All American Road” and “State Scenic Byway”) makes Rocky Mountain National Park backcountry skiing so accessible. Historically, skiing has played a big part at RMNP because of Hidden Valley, a ski area that operated inside the park from 1936 to 1992. The lifts are long gone, but the runs are still evident, creating a welcoming place for backcountry skiers seeking both steep and intermediate terrain. Trail Ridge cuts through the middle of the area, and it’s an easy hike from the road to the trails. Even in June, the snowbanks on Trail Ridge Road tower over 12 feet tall. With a top elevation of 12,183 feet, Trail Ridge is the highest continuous auto road in the country. It’s important to note that there’s no avalanche control, and like all backcountry ski adventures, you need proper gear and knowledge. The peaks around and inside of RMNP are known for rapidly changing weather, and summer afternoon thunderstorms are almost a sure thing. Wet slides are common when summer temps heat up the snow. Altitude sickness is also a real hazard, particularly since Trail Ridge Road offers the opportunity to go from lower to higher altitude so quickly. For the uninitiated, the best way to experience summer skiing in Rocky Mountain National Park is with a guide. Guiding services based out of Estes Park include the Colorado Mountain School: Visit www.coloradomountainschool.com to book a guide. 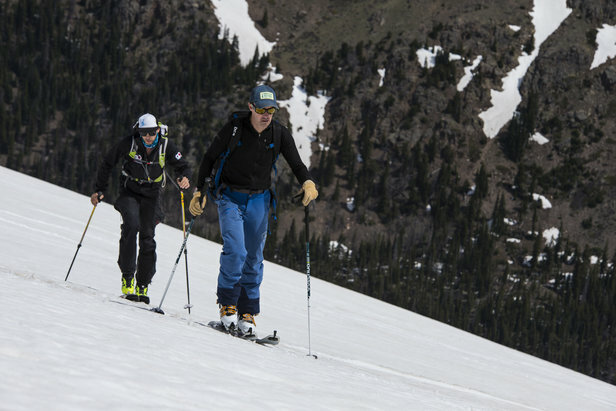 In June, four of us, all experienced backcountry skiers, set out for an excursion in RMNP. Our small party included Liam Doran, photographer, Ian Fowler, AMGA certified Colorado Mountain School guide, Joe Risi, event coordinator for Scarpa, and myself. Upon loading Joe’s vintage Land Cruiser with our gear, it became apparent that he had the lightest equipment of the bunch. Risi organizes and competes in backcountry races, necessitating a lightweight randonee set up. He says his rando gear “makes a morning an epic” enabling him to triple the amount of vert he can get with standard AT gear. His Scarpa Alien 1.0 boot weighed a mere 1 pound, 8 ounces. His Atomic Backland 85 ski had a lightweight woodcore with a carbon backbone, and the description for the Dynafit TLT Speed Radical binding says it’s best for “speed touring” and “ski running,” which is what it looked like Risi did up the slopes. 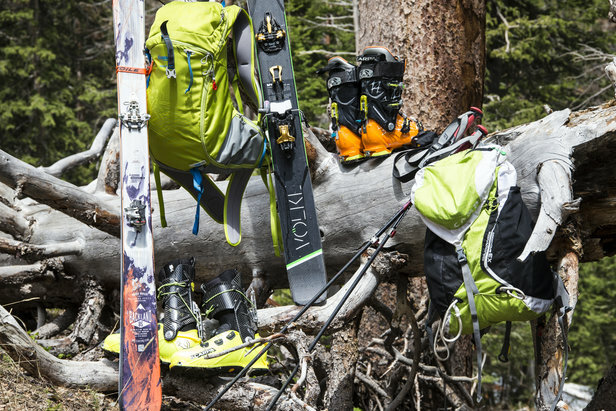 The rest of us were on AT (alpine touring) gear since we value the downhill performance of a slightly beefier setup while needing the technology to skin uphill. Alpine Touring or randonee gear work well for summer ski adventures, and avalanche safety gear is a must. With afternoon thunderstorms in the forecast, we choose two easily accessible areas to ski that morning: Sundance and Hidden Valley. 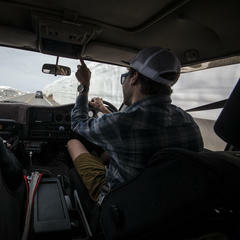 We brought two cars, parked one near Hidden Valley and piled into the second car. Fowler suggested we start at the highest point in case the weather came in earlier than expected. I grabbed a map at the entrance of the park, but Ian, in guide fashion, pulled up a Topo map on his phone. We crossed paths with a fox several times as we skied nearly 1,500 vertical feet, deciding to skin back up so we’d have enough time to ski at another location. Doran had ample inspiration for great scenic shots. Fowler set a nice skin track, gradually switchbacking up the slope, while Risi “speed toured” straight up. My moto while skinning: Slow and steady wins the race. 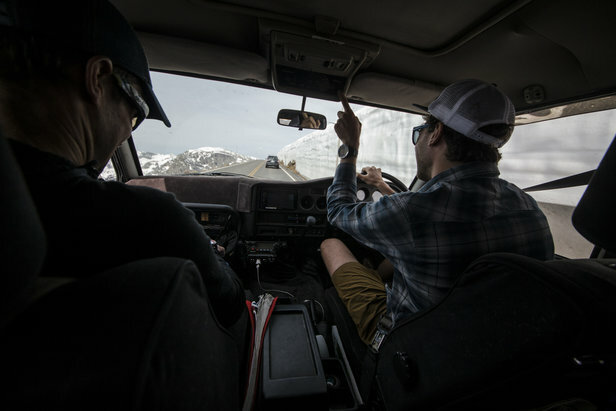 Colorado Mountain School guide, Ian Fowler and Scarpa event coordinator, Joe Risi skin up Sundance for another lap of summer turns. We drove back down Trail Ridge and parked near Rainbow Curve. It was a short hike through high alpine tundra peppered with pasque, or wind flowers, to the old ski runs of Hidden Valley. The trees were wind flagged, residing in an area that gets hammered all winter long from gusts, but some snow—albeit dirty and sun effected—still remained on the old T-bar line. Being later in the morning, we tested our balance as we made turns down the soft snow that covered the old runs; it was beautiful and quiet, with the faintest echoes of waterfalls and car engines. Adventurous skiers can choose from a list of bigger tours, like routes on the Tyndall or Andrews Glacier. We were content with our low-commitment runs in the early-summer sun. Back at the car parked near Hidden Valley, we changed into shorts and flip flops, thankful that Doran had remembered his car keys (and didn’t leave them at the top in the other car). We headed back down Trail Ridge Road—past meadows, ancient Ponderosa trees, an owl, a moose and many tourists—to the nearby town of Estes Park. There we enjoyed lunch and beers al fresco, next to the raging river near peak flow, transporting the melting snow that we glided down hours before.